This year is all about the alternative festivals. From castles and underground caves to spectacular beach fronts, there are some spectacular venues and stellar line-ups that prove the best music festivals aren’t always the biggest. But it’s not just the quirky locations that set them apart, it’s their unique vibe – intimate, friendly and feel-good – that means you won’t forget them in a hurry. Ready to embrace the boutique festival? Here’s our guide to the best music festivals around the world. recommended by electronic music geeks Resident Advisor. As the little sibling of Dekmantel Festival, Lente Kabinet has big shoes to fill. But they’re more than up to the challenge: you can expect top-shelf production and a killer lineup every year. As always, Lente Kabinet goes down at the lush Het Twiske parkland north of Amsterdam over one afternoon and evening. Dekmantel may be bigger than ever, but you can always count on a cozy waterside rave as long as Lente Kabinet is around. It makes sense that a city like Bristol should have a festival like Love Saves The Day, which returns to Eastville Park across two days this May. Anyone who grew up in the area will have likely spent their years listening to all sorts of dance music, from local-brewed sounds like trip-hop and drum & bass to dubstep, techno and grime. One of the best music festivals in the UK, Love Saves The Day totally reflects this wonderful diversity. This fest is simple: Distortion turns the lovely city of Copenhagen into party heaven for five glorious days and nights. A host of massive daytime street parties, underground night club events, and a grand two-day finale Distortion Ø at Refshaleøen and the Copenhagen harbour. The vibe is killer. Devised by the crews behind Outsiders Festival, Red Light Radio and The Rest Is Noise, this one-day festival is a must for globetrotting alternative music fans. As soon as you disembark the ferry at the trendy and secluded NDSM docklands in the north you’ll become a cultural castaway in their bizarre and beautiful experiment. Astropolis is close to the heart of dance music in France: now in its 22nd year, it’s a rare vestige of the country’s free party scene, which was mostly extinguished in the mid-’90s. The festival is still going strong in 2018, with a robust winter counterpart to its main summer event. The six-day programme for Astropolis L’hiver 2018 presents exhibitions, film screenings, vinyl markets and Ableton workshops, as well as nightly concerts and club parties. Polifonic is a three-day event at Masseria del Turco, a historic building surrounded by olive groves in the Itria Valley, near the beautiful Mediterranean coastal spot of Monopoli. The lineup strikes a balance between hard-edged experimental and soulful sounds split across three stunning stages hidden amongst yoga classes, a chillout area and art exhibitions. Peacock Society is returning to the indoor/outdoor Parc Floral, which, after several editions of the festival there, should guarantee the usual charged atmosphere. Garnier is back in the headlining slot this year, and he’s joined by fellow heavy hitters like Tale Of Us, Sven Väth, Helena Hauff, Steffi, Maceo Plex, Kerri Chandler, Four Tet and Floorplan. They’ll all be soundtracking what’s become one of the best big-room experiences on the international festival circuit. This year Poland’s premier experimental music festival takes place later than usual across October 8 – 15th. This year’s edition centres around the theme of “Flower Power” you can expect ornate techno and experimental acts that span genre and sound. Split across a variety of venues across Krakow (which has included a salt mine in previous editions) – the city is your playground for the week. RA’s Dominic Kocur described the crowd at Field Maneuvers as “one huge extended family” when he visited two years ago. The festival has added room for an extra 300 people since then, but with a current capacity of 800, Field Maneuvers is still about as small as UK festivals get. Looking at its lineup, though, you wouldn’t guess this was the case. Year after year, Field Maneuvers has locks down a killer selection of top-tier house and techno talent. You could argue that Kasteel Van Horst, a castle in Holsbeek, Belgium, is Europe’s oldest dance venue. Back in the 17th century, Flemish nobles went there looking for a night out. Some 400 years later, it became home to Horst, a small festival that combines modern club sounds with visual art, workshops, lectures and more. Changes are afoot at Reworks, Greece’s best-loved electronic music festival. It’s been extended from three days to five for the first time, and has announced Reworks Agora, a new programme of workshops, panels and talks. Held across a number of quirky Thessaloniki venues (including the labyrinth-like Mylos multicultural complex), Reworks has been a beacon of stability in the midst of Greece’s economic woes. Located between Tulum and Playa Del Carmen, Parque Dos Ojos is home to a vast underwater complex of caves aka “cenotes.” The water is bright blue and crystal clear, perfect for a quick dip in between performances at this year’s Comunité, a vegan, eco-friendly festival that’ll have the run of Parque Dos Ojos for its fourth edition. Each winter, Igloofest brings together thousands of electronic music fans to dance under the stars at Montreal’s Old Port. Bringing together icy decor and steel structures, powerful architectural projections and programs featuring the best local and international DJs, it’s certainly one-of-a-kind. Not to mention their winter fashion competition “Iglooswag”. The Castle of Good Hope, South Africa’s oldest colonial building, will play host to Into The Castle, a brand new festival from the crew responsible for both Into the Valley and Into the Factory festivals in Sweden. Their most intimate boutique festival yet, capacity sits at 2000 with a program spanning local music, art and technology. As well as the core festival, parties will sprawl across Cape Town during these five spectacular days. “It blew us off our feet.” This was Dekmantel co-founder Thomas Martojo’s reaction when he visited The Jockey Club in São Paulo, the site of the daytime programme for Dekmantel’s festival in Brazil. Attendees will likely have a similar reaction. Located in the sprawling city’s west, the 30s-era hippodrome boasts a wonderful view of São Paulo’s skyline, while also offering a unique space full of intriguing little corners. Whether it’s new or old, there’s a huge amount of interest in South African electronic music right now, and rightly so: it’s a country rich with talent and passion. Events like Cape Town Electronic Music Festival are crucial to the continued blossoming of the country’s scene with a series of workshops and performances, taking place in central Cape Town and beyond. Few cities suit the cosy winter months like Graz, in Austria. Elevate, which moved from October to March for the first time last year, focuses on cutting-edge sonics delivered by a cast of forward-thinking techno and experimental acts at unique venues about town—clubs, concert halls and arts spaces. Describing themselves with adjectives like “brut-tropical” and “neoteric,” Pitch Music & Arts is the latest alternative festival to join Victoria’s budding scene of chic yet rural electronic music festivals, booking sure shots like Paula Temple, Mike Servito and Head High at the disarmingly beautiful landscape by the Grampians Mountain Range. The Netherlands is home to plenty of festivals heavy on ice cannons, confetti explosions and booming techno beats, but in The Hague they take a subtler approach. Rewire, returning for its eighth edition over one weekend in March, puts the focus on what it calls “adventurous sound.” In 2018, that means a range of artists covering neo-classical, jazz and pop, playing in churches, theatres and clubs. Together shows what a well-done festival can do for a local scene. Boston has long been home to a proud cast of inspired DJs, producers and promoters, but it wasn’t until this week-long, multi-venue series of events that they saw what would happen if they all worked together. Combining seven nights of parties at clubs across the city with a daytime program of illuminating panels and workshops, Together aims to not only put on a week of killer music, but also to strengthen its city’s scene. Safe to say they’ve succeeded. Donaufestival is a bit of a dark horse. With a small number of artists playing a handful of venues in the Austrian city of Krems, it keeps a low profile in Europe’s bustling festival market. And yet, year after year, it nabs some of the boldest and most influential artists in electronic and experimental music. As if for good measure, they’ve thrown in a few seminal post-punk bands as well. The sight of Antal’s two daughters happily dancing around on stage while their father DJ’d was one of the enduring images of last year’s Rainbow Disco Club. That scene illustrates what this festival is all about. The atmosphere is warm and inclusive. It also happens to take place in a spectacular setting, nestled among the hills of Izu, a coastal area in Japan known for its natural hot springs. The end of the US embargo of Cuba was a historic event, and Manana Cuba is taking the opportunity to bring the island’s rich music culture into contact with electronic music from across the globe. Expected to run from May 3rd to 5th in Santiago De Cuba, this exciting small festival will pair local artists with international guests for collaborative performances that’ll see unknown Afro-Cuban artists interacting with names we know and love. Techno events in East Asia reflect something at the core of the region’s cultural DNA: zen philosophy. While Western parties and the artists they book tend to emphasize the heavy side of techno, our Eastern counterparts favor more hypnotic and spiritual sounds, suggesting a state of transcendence and, when heard in striking outdoor locations such as Organik Festival, a heightened connectedness with nature. Got a super cool festival tip you want to share with our travel community? Tell us in the comments below ? 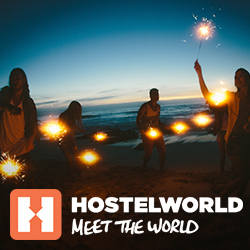 The post 25 Best Music Festivals You’ve Probably Never Heard Of appeared first on Hostelworld Blog.